For Hendrix enthusiasts, and the historical record, this latest (and hopefully not last) installment is priceless in its way. Do we, at this point, require further evidence that Jimi Hendrix was the most prodigiously gifted guitarist to ever play the instrument? We do not. Then again, we don’t need additional proof that stars glow at night, but it’s still nice to see them light up the sky. Not so long ago, Hendrix’s compact but concentrated recording career was measured by the official albums released before his death. Aside from bootlegs that ranged from inauthentic to unconvincing -- and occasionally exultant -- Hendrix’s posthumous legacy was marred by mystery. How much unrealized material languished in the vaults? Who oversaw it? In recent years, members of Jimi’s family, operating as Experience Hendrix L.L.C., have controlled the keys to the kingdom. Since 2010 there has been a steady -- and quite welcome -- succession of revelatory recordings, including West Coast Seattle Boy and Winterland (both box sets) and the single-disc Valleys of Neptune. Much of this material has never seen the light of day so, taken together, they significantly broaden our understanding of how productive, and incomparable Hendrix really was. The gifts continue to arrive, this time with the release of People, Hell & Angels. 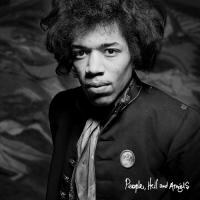 For Hendrix fanatics, each new installment signifies an event and is to be celebrated accordingly. Of course the aficionados will know in advance how much of this material has appeared, in various forms, on previous releases – both sanctioned and not. For the merely curious, or anyone who has not yet properly experienced Hendrix (are you experienced? ), this is not the place to start. For anyone else, this disc, like the aforementioned Valleys of Neptune affords the chance to get caught up on a dozen tracks all in one spot as opposed to the aforementioned bootlegs. Put another way, this is hardly essential unless anything Hendrix did is essential and you want to hear everything he did. What these recent releases all have in common is the case they continue to make that Hendrix was, as his debut album amply illustrates, a fully-formed player (and performer). Even as he grew and explored, he was seldom in one spot, aesthetically speaking, for long. The dates of the various sessions comprising this collection underscore what many people have long understood: Hendrix could shift seamlessly from the psychedelic adventures of Electric Ladyland to the straight-up, occasionally hard-edged blues, and seemingly every rock style in between. It is, in fact, the blues idiom that gets a more than casual treatment on several tracks. Unlike many of his more polished performances, the songs included on this set, including a spirited take on the Elmore James classic “Bleeding Heart” and Hendrix staple “Hear My Train a Comin’” are no-frills affairs. Being works-in-progress they have not been multi-tracked or embellished with studio effects; as such they prove (yet again) that Hendrix was extremely comfortable using the classic blues formula as a point of reference -- and departure. Even more enchanting are two tracks that have appeared, in different or edited form, on earlier releases. “Villanova Junction Blues”, which Hendrix would later play at Woodstock, is a snapshot of what the guitarist was trying to capture in the studio: still unfinished, it’s a crucial addition to the Hendrix canon. “Easy Blues”, which initially appeared on the impossible-to-procure 1981 release Nine to the Universe is yet another testament to his genius. It serves as (yet another) showcase of Hendrix’s dexterity and boundless technical proficiency; this should serve as the “I can’t believe I’ve never been able to hear this before” moment from People, Hell & Angels. There are a handful of new versions of very familiar tracks, such as “Somewhere”, “Izabella” and “Hey Gypsy Boy” (which would eventually become “Hey Baby (New Rising Sun)”. Perhaps most intriguingly, there are the genuine out-of-left-field oddities, such as “Let Me Move You”, which features saxophonist Lonnie Youngblood. “Mojo Man” includes uncredited horn players and lead vocals from Albert Allen, while “Inside Out” features Hendrix on guitar as well as bass (recorded in 1968, this is a result of the increasingly strained relationship with Experience bassist Noel Redding). Not quite filler, much of this material is anything but indispensable. On the other hand, considering how fleeting Hendrix’s recording career turned out to be, it's remarkable that so much material was recorded. In this regard, Hendrix was way ahead of his time, ceaselessly working in his own studio and putting jams and improvisations on tape. What remains are fragments that got worked into more refined compositions, and enticing snapshots of ideas and visions that never had a chance to reach fruition. For Hendrix enthusiasts, and the historical record, this latest (and hopefully not last) installment is priceless in its way. Any time we have an opportunity to hear Hendrix, particularly the incomplete works that clarify how his restless creativity operated, we are amassing additional (if unnecessary) validation that Jimi Hendrix, as an artist and explorer, has few peers in modern music.